The club can be used for small weddings, staff do's, seminars and parties, you tell us what you need and we will see if it can be done. Some conditions do apply. Just call our office administrator Toni for details and what is available. Just remember our members have access at all times, that said we always make the effort to stay in the background and of course help if we can. You can contact Gavin on (09) 434 0909 or call in and talk to our bar staff. Check out some of the functions, click on the picture. The club is not available on a Friday night for private functions. The ideal number for sit down functions is no more than 100. 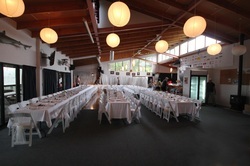 Costs to you may involve hiring more tables and chairs for larger functions as we are limited in this area. We are not an event centre and cannot close the club off from our members. However, we can close the restaurant for larger private functions. This must be taken into consideration when planning an event. Catering is provided by our own chef. However, for larger functions we can negotiate this with you. All drink must be purchased through the bar. Speak with our Head Bar Manager if you wish specialty wine purchased for the occasion. For larger functions a detailed plan of the event needs to be approved by the committee. The committee meets every third Tuesday of the month. Contact Gavin Boland - gavinboland@xtra.co.nz for further information.